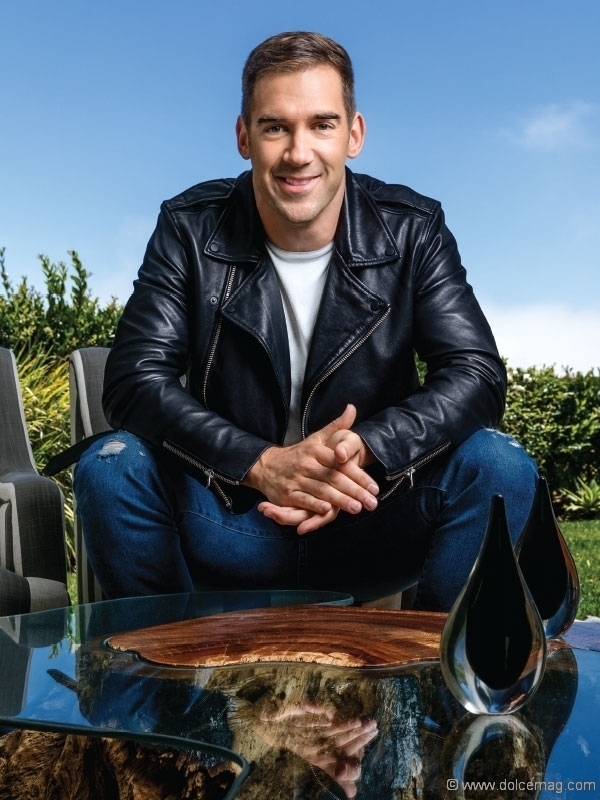 On his journey from bullied outsider to thwarted pro athlete to the eternal optimist behind The School of Greatness podcast, Lewis Howes uncovered an uncanny recipe for success. The best-selling author and entrepreneur learned to treat life like a favourite sport filled with coaches that could train him. 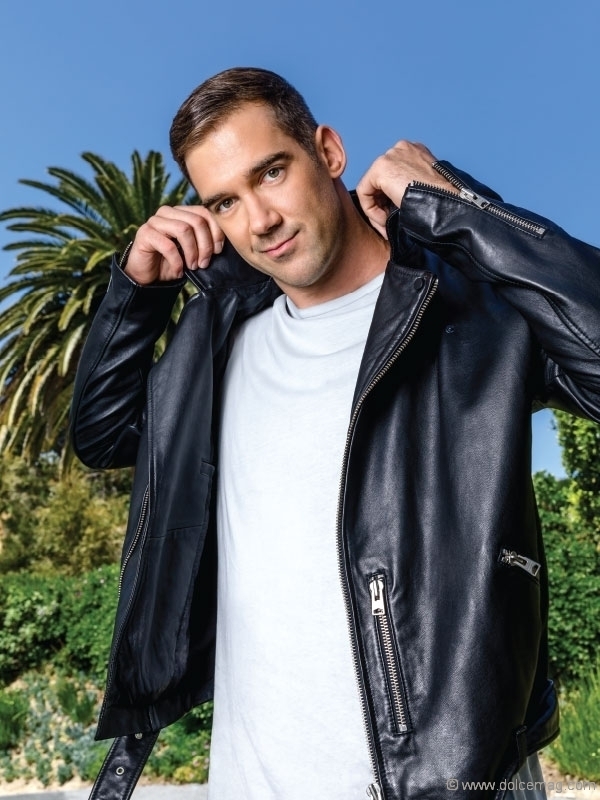 Howes welcomed Dolce Magazine to Los Angeles for an on-location cover shoot with open arms (literally) and gave us a primer on his winning way. 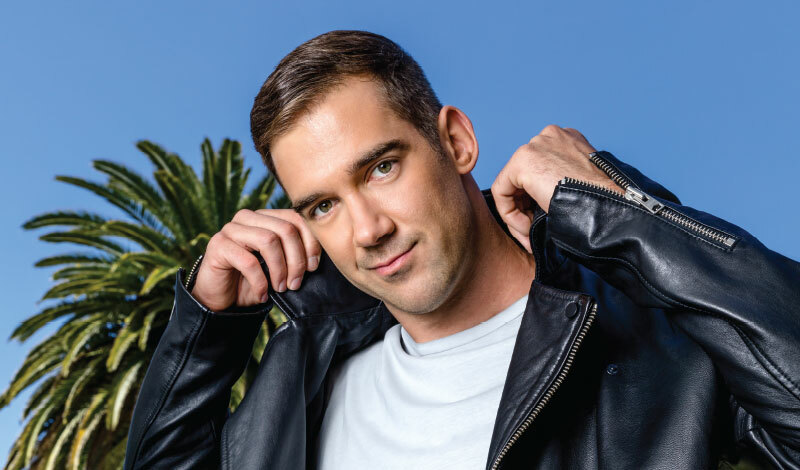 Lewis Howes was an easy target, bullied and picked on relentlessly as a kid. Self-described as “tall, skinny and goofy-looking,” Howes found school challenging; he couldn’t understand what he was reading and found it difficult to read aloud, so he was always at the bottom of the class academically. “I didn’t have any friends,” he states. Fast forward to today. 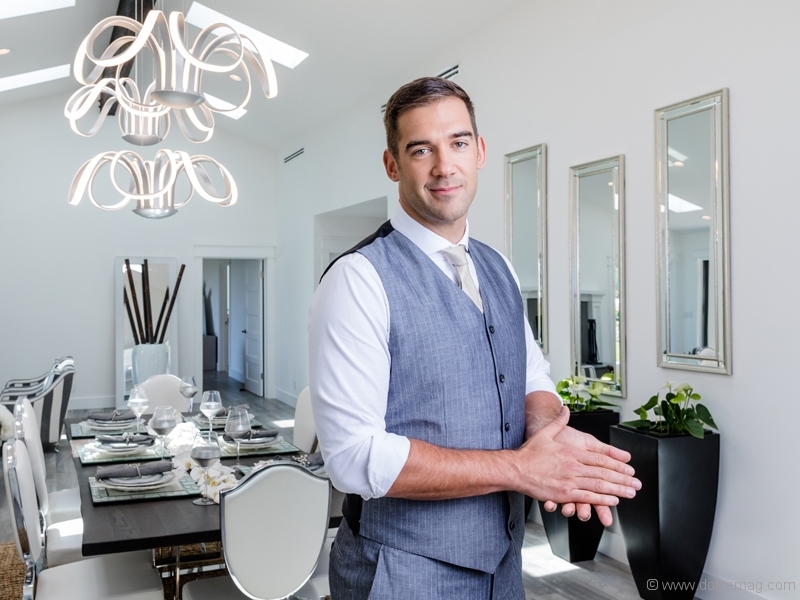 Howes, 34 years old, has bought several seven figure businesses and sold one. He’s a bestselling author helping others achieve their dreams through his book and podcast, The School of Greatness, which was named one of the top podcasts in the world, with more than 35 million downloads. In fact, in 2013, President Obama himself named Howes one of the top 100 entrepreneurs under 30 in the United States. He’s a former pro athlete and former world record holder in football. And now he plays on USA Team Handball, the national handball team. You may be asking yourself, how did this happen? Perhaps it started here: Every summer, Howe’s parents sent the kids to a Christian summer camp. Howes met kids from a boarding school in St. Louis who were different from the kids in his small town. Fun, creative and welcoming, they inspired Howe, who wanted to make a change. He knew that he didn’t want to end up in prison like his brother. He went home and begged his parents to let him attend the boarding school — which he did, starting in Grade 8. Howes began playing football in his sophomore year. And he was really good at it. Howes channelled all of his energy into his dream of becoming a professional athlete. “My whole life was dedicated to becoming an athlete and playing professional football, because that’s all I cared about,” says Howes. He went on to play football in college and set an NCAA record for the most receiving yards in a single game (418 to be exact), then he left college early to pursue professional football. But after playing only two games of his first season in the Arena Football League (a step below the NFL), he dove to make a catch and hit a wall. Literally. His wrist snapped. Howes was so determined that he played the rest of the season with a broken wrist. But after the last game, he underwent surgery that ended his football career. “When my dream of playing professional football was over, I was in denial, because I thought that was what I was supposed to be doing,” says Howes. How do you pick up the pieces when your life falls apart? “When I lost my identify [as a football player], it was a depressing time, but I just said, ‘I need to figure out who I am now,’” Howes says. In fact, eight years ago, he was still sleeping on his sister’s couch. “After a year and a half of that, my sister said, ‘Okay, maybe you should get a job, help pay for food.’” Fair enough, thought Howes. He didn’t feel he could stay any longer without supporting his sister. He started looking for a job on Craigslist. “I got an interview, and I was getting ready. And for whatever reason, I was convinced I was going to get the job,” says Howes. “I thought, ‘If I go to this interview, I’m going to get this job, and it’s going to delay me from actually going after what I want. This is not what I want.’ It just wasn’t part of my vision.” And that was the impetus that spurred Howes into doing something about his vision. He didn’t go to the interview that day, and he never applied for another job. “I just said, ‘I need to figure out who I am now. Who am I? Who do I want to be? What do I want to create in the world?’” says the entrepreneur. Howes started out on a journey of self-discovery, reaching out to mentors, finding people who had achieved their dreams, and starting to learn from them. “I started to study them, ask them questions about how they did it. In that process, I started to discover more of what I wanted to do,” he adds. One day, when Howes was still living on his sister’s couch, he was watching the 2008 Olympics on TV when he saw coverage of the handball event. He was hooked. The New York City Team Handball Club had a reputation as the best handball team in the United States. Howes was determined to move there and play on the men’s squad. He spent a lot of time on the Internet trying to find a business model with which he could earn enough money to do so, finally deciding to launch a LinkedIn group for sports executives. It was so successful that he was able to make the move. One day he was driving in Los Angeles, moving about two miles an hour and missing New York that an idea hit him. “I just said, ‘There’s got to be a better way.’ There are so many people stuck in traffic, stuck in a relationship, stuck in their lives. There has to be a way to inspire or inform people who are commuting all day long, to give them information that can help them move faster in their lives and get there quicker,” says Howes. Howes emphasizes that when we lean into our curiosities, we allow ourselves to think, ‘What if?’ “We can feel a certain reaction around these thoughts, and those reactions that you feel most powerful about — those are the things you should lean into.” Then ask yourself what the next step should be, and the next step after that, and so on. In high school, Howes remembers reading a quote often attributed to Theodore Roosevelt: “Nobody cares how much you know until they know how much you care.” That really resonates with Howes, who says that if you’re a good person, you show up as connected, loving and present. He claims Maya Angelou said it best: “I’ve learned that people will forget what you said, people will forget what you did, but people will never forget how you made them feel.” That’s exactly how he tries to live his life now, as a grateful person. At the photo shoot for this article, Howes asks an assistant to take some uneaten panini back to the office for his staff to enjoy, ever mindful of others and loath to senselessly waste food. And he has no time for complaining either, despite spending hours with the camera crew in the hot California sun. In fact, Howes is all smiles. Howes is always on the go. “I travel a lot; I do speaking events. Last year I was in Iceland for a week and India for two and a half weeks. Since I play with the U.S. national handball team, I was in Brazil and Argentina for that, and I was in Guatemala for Pencils of Promise,” says Howes. Still, he manages to find a balance. “I have a great team that supports me and supports the vision to impact the world in a positive way; everyone has a role,” he adds. What’s coming down the pipeline for Howes? Right now, he’s finishing up a new book and working on a documentary. “I’d like to interview The Rock and Will Smith,” says Howes. “I’ve worked with Ellen [DeGeneres] and her team is amazing — we’re going to be doing more work together. In due time I’ll be working with more people like The Rock and Oprah,” he adds. It’s tough to know where to start, how to make the first move. One thing to keep in mind: People like to help. Howes began by approaching local leaders when he was living in Columbus, Ohio. One such mentor was Chris Hawker, an inventor from Columbus, Ohio, who has marketed many of his ideas. “I really got to study what it meant to come up with ideas,” Howes says. “What’s a great idea? How do you package an idea into something tangible that’s a solution for people? How do you brand it? How do you market it?” He connected with other business leaders as well. “I just found the person who was great at it and then studied how they did it.” Or he would simply ask them what they thought he should do, and they would coach him. Picture this: If we aren’t clear in our vision of the amount of money we want to make, the people we want to spend time with, etc., then we’re going to be bouncing around in life like pinballs in a machine. “When we’re clear, then we have a compass we can move toward,” says Howes. Without vision, it’s easy to get stressed, anxious and even depressed, he adds. “I try to keep it simple: What do I want? Why do I want it? When do I want it to happen by?” By answering those questions, Howes says that we can create guidelines for our lives, make easier decisions and, when opportunities come our way, say yes or no very quickly, depending on whether it supports our vision. That’s not all. Howes suggests we need to set expectations for ourselves, but be sure that we are communicating them to others. “The more expectations you have, the more let down you’re going to be if someone doesn’t meet the expectations,” says Howes. “So I think we should have expectations and be sure to communicate them. When you are clear, then there’s a mutual understanding in relationships with family, friends and co-workers. It’s when we aren’t clear that there are letdowns,” he adds.